[S02E06] The accessibility of our websites is not something many of us like to think about. However, we have a legal and morale obligation to do so. I have agonised over how to approach this week’s subject. 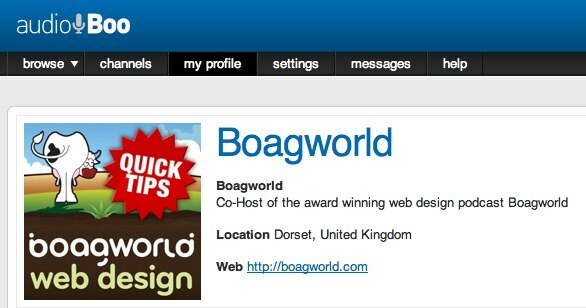 I wanted to take the accessibility of boagworld seriously and demonstrate best practice. However, I also wanted to be honest about how hard this can be in the real world. As a starting point I decided to talk with accessibility expert Derek Featherstone. This proved to be a challenging conversation as you will discover below. Audio transcription: If you’re producing audio content, you need to get it transcribed and should release the transcript and content together. HTML5 Accessibility: If you’re using HTML5, be aware that not all screen readers/browsers/operating system combinations fully support it yet. Providing Keyboard Access: Keyboard testing is critical and is very easily testable by developers. I thought I was doing pretty well when it came to accessibility on boagworld, but Derek pushed me to do more. This has left me feeling conflicted. The problem with accessibility is that many feel torn between the right thing and what is practical in our circumstances. As Derek said accessibility can be hard work. Doing the basics (such as alt tags, semantic code etc.) is easy and we should do them as a matter of course. However other things are much more difficult, especially when you start involving audio and video (something I do a lot). The issue of transcription is something I struggle with. A word for word transcription of every podcast presents a couple of problems. First, it will become expensive or put an unreasonable demand on our team of volunteers. Second, it requires us to plan much further ahead in our recording schedule to allow time for transcription. One could argue, as Derek, did that these are poor excuses. As a company with such high prominence in the web design community it is our responsibility to demonstrate best practice.Headscape can afford the transcriptions and a lack of planning ahead is a poor reason for making something less accessible. Although Derek is right, I don’t think things are quite so black and white. For a start we provide extensive blog posts, which although not word for word transcriptions do communicate the same subject material. I believe in many ways these posts are more accessible than the transcriptions because they are concise and well written. Sure, they lose some of the personality of the show, but I don’t believe that translates into written form anyway. Things also get complicated when you are putting audio and video out on a rapid schedule. In my case this includes the daily audio tips I release. Because these are recorded and released on a daily basis it is much harder to provide transcriptions. Admittedly it would be possible to record these in advance and schedule them. However, to be honest it would be just too much hassle. If I was forced to do so I would simply stop doing them as the return on the investment could not be justified. This is where pragmatism has to come in. The problem is that pragmatism can cover for a variety of sins and can justify pretty much anything. When I have written or spoken about pragmatic accessibility in the past this has been used as an excuse by some for not taking accessibility seriously. This is why so many accessibility advocates avoid it and instead take a more fundamentalist stance. They fear that if they give an inch people will take a mile. The danger of an extreme position is that those with good intentions feel like they are striving for an unattainable goal and so give up entirely. Ultimately each of us need to decide on where we should draw the line over the accessibility of our site. There are no absolutes. That said, we need to avoid becoming complacent. It is easy for accessibility to slip down the agenda or for us to stop striving to improve things. That is why I found my chat with Derek so useful. He made me focus on accessibility again and encouraged me to look for ways to improve things. We almost need somebody to push us on a regular basis to think more about the accessibility of our sites. This could be a peer from within the industry, a colleague or an accessibility expert (depending on budget). 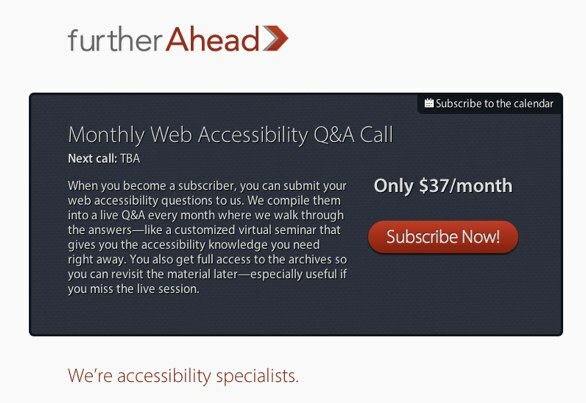 In fact Derek has started offering a monthly accessibility call, similar to my own consultancy clinics. You might wish to consider using the service. What talking to Derek has done is push accessibility back up my agenda, which has to be a good thing. It has got me reading on the subject more and investigating services that may make life easier. Derek has proved invaluable in pointing me in the right direction and so I wanted to conclude by sharing some of the articles he has shown me. The impact of block links in HTML5 on accessibility. Some great advice on managing overlays and lightboxes so they remain accessible. A great case study on improving the accessibility of an airline company. Derek recommended a great transcription company he uses.